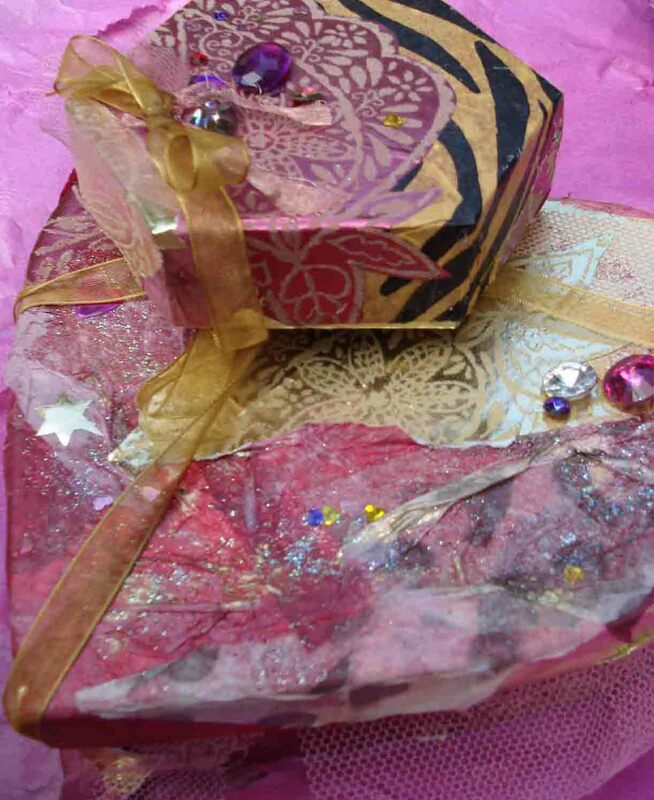 Do you save gorgeous/interesting wrapping papers, chocolate boxes with nice shapes, ribbons you cant throw away, mounds of coloured tissue paper all waiting to be used ? well that's me and anything else beautiful that comes along. There are also lovely patterned papers/ tissues and papier mache boxes in assorted shapes and sizes from craft shops you can use if you don't save stuff. For these decorative collaged pieces I raided my stash to find flocked metallic xmas paper from Sainsbury's last year mostly trashed by the family, but pieces still useable, some bright coloured tissues from flower wrapping and some lovely animal print tissue that Evie had wrapped something for me in, also net fabric goes into the mix. Get it all out and pick out colours and patterns you think go well together. This is a valuable exercise in 'getting your eye in', mainly intuitive and a personal thing, you can feel what is right, what goes, what is a good clash, what is exciting, what is boring. But don't worry too much, you can often surprise yourself, when its finished. Basically the more you practise with this type of exercise the more natural and easy it becomes. Tear up pieces of your papers, some larger some smaller, stripes and random shapes. You can roughly try them out on your surface to get an idea of placement, i.e. patterned against plain, pink against green for complementary colouring or colours that blend for harmonious effects. Or just go for it. Pvc is the glue I use I have a large litre carton of it from Early Learning for kids--its cheap and last a long time. Decant into a screw lid pot. Cover boxe and paper pieces with glue and start covering your surface. Crumple your tissues slightly as you lay it down, for texture. Cut out motifs from the patterns and try them out. Don't be too precious. This is a good start for a complete beginner who sometimes isn't sure what to do and how to start, but anyone can also play. I view it as a limbering up exercise where there are no rules, no requirements, just enjoy being yourself and making a mess like at school. You have to do this sometimes to let the creative you out of that box, the one I'm so often stuck in. View your first attempts as 'learning curves', don't judge too much, keep your mind open. Fill in gaps with smaller pieces. Lay over in some areas, torn net, for more added texture. Go round the sides as well, tuck the extra salvage over the edges to the inside of the box. Cover your base. Enjoy the colours. Let dry or dry with heat tool/ hair dryer or radiator. Tart it up. Using a refined selection of your cut glass gems, sequins, an organdie ribbon bow in a matching (or not) colour, glue them down, and some light glue spread in certain areas sprinkled with your stardust glitter will add the magic. The inside can also be treated to a makeover with a coordinating tissue. Once you get the bug. Collageing your trash stash can go further. Collage onto sheets of paper and use for backgrounds for atcs, journals altered books etc. Cut to wallet size opened say 11x4 ins or 29x10cms approx that's a big one. Glue your stuff as above onto the plastic rightside down. Alternatively which maybe easier, collage onto same size paper then stick this down on the plastic. Cut some backing fabric 3/8 ins larger all round and turn over edges onto front and machine all round. If you have time /inclination cut same plastic same size but slightly narrower for inside of wallet cash, plus an extra piece for c. card insertion and sew this in when you sew the fabric edging down, this will make it into a real practical wallet if you so choose--its not all that difficult to scramble together--look at a real one for ideas, or it could be a check book cover. The important thing is to experiment with collageing and creating an interesting surface. Later you could make an ipod cover (google a template) for instance or a book cover. I like to be practical sometimes, must be my post war upbringing. Find a suitable method for closures. Velcro, sewn on button, colourful beads, broken jewellery, may be ideas, think creatively. At this stage its not too important, make it fun. Measure box including sides. Find a picture you like. For the background enlarge a suitable part, approx the same size as box measurement, in an imaging softwear prog, use guides. Use the main part of the picture, say a pretty girl, to make the size you want for a cut out to sit on the top. Find some butterfly wings to make fairy wings a suitable size for the image. Arrange on an A4 sheet. Make sure the colours are nice and strong.